I had a special guest star at storytime recently: a Marching Band! I contacted members of a local high school marching band, and coordinated a visit to storytime. We did it on a day where there was no school, and the teens were able to get extra credit for visiting. I had about 15 band members visit with their instruments, and it was fantastic! Asking my band to stop playing five minutes before storytime started so people could get settled. 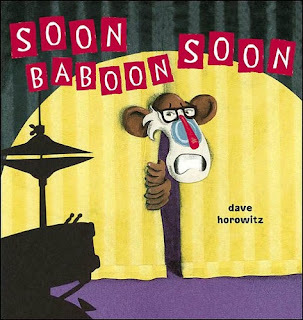 Playing one of the familiar music cds I usually play before storytime. Making sure that I was visible, welcoming, and reassuring as families arrived. I did my normal opening song and our letter of the day with Fergus, then introduced the band. I had each of the teens say their name, what their instrument was called. Then the played a quick scale or rhythm to show what their instrument sounds like. 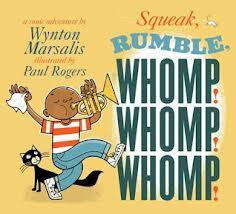 Then I read Wynton Marsalis' "Squeak, Rumble, Whomp! Whomp! Whomp!" Each time I came to an instrument that was in the room, I paused and prompted the teen with that instrument to give us the 'real' sound. I talked about sounds a lot with the kids, specifically high and low sounds, and we practiced a lot of sounds as a group. 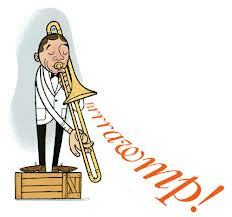 The trombone was particularly popular! But we did have to adjust our tape line to accommodate the reach of the trombone and make sure no littles were sitting right in the way. After that, the band played their school fight song, and "Happy and You Know It" and "ABC's" while we sang along. 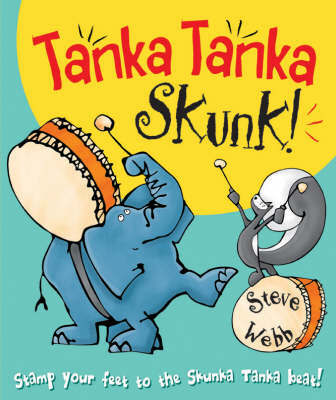 Then, with the help of the drum we used our voices to make beats with the book "Tanka Tanka Skunk" by Steve Webb (a new favorite of mine). Then we added a new twist to our favorite storytime song of all, "The Watermelon Song" by singing it with musical accompaniment (I told the teens that if they didn't know Frere Jacques/couldn't play it they had to sing and dance with me). Then I sang our closing song, we clapped for the band, and I invited kids up for hand stamps (every member of the band also lined up for hand stamps). You may want to put up noise-level warning signs for patrons if you do this! My colleague also did a kazoo parade through the library when she did this, but that wasn't a great fit for my library (though it would have been fun). Oh, wow, I love this idea! Hmm, how can I pull it off?